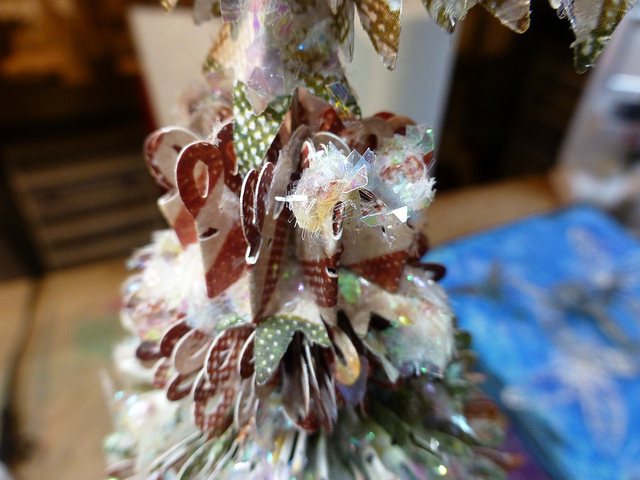 The Gentleman Crafter: The Tree...De-Twigged! The tree has 18 layers. It stands 17-inches tall. 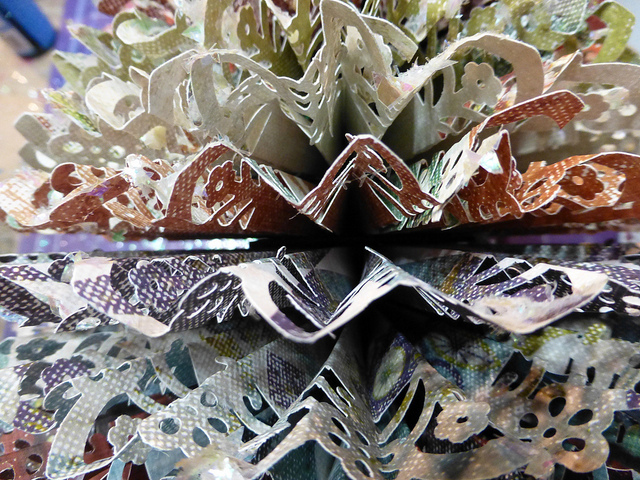 The paper collection I used was Tim Holtz Idea-ology Seasonal Paper Stash - Holidays Past...LOVE IT!!! 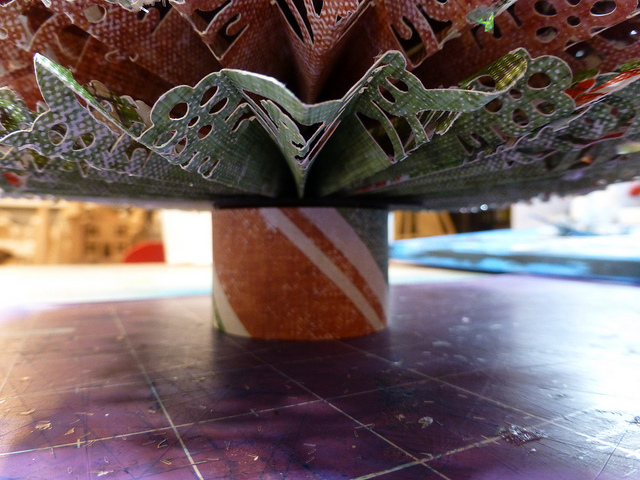 For the base, I used a 3-inch round paper mache box and covered it with a strip of the Tim Holtz paper. I then hot glued the bottom of the box to the bottom of the tree, centered. This is where I stood the last strip on end and glued it in place. 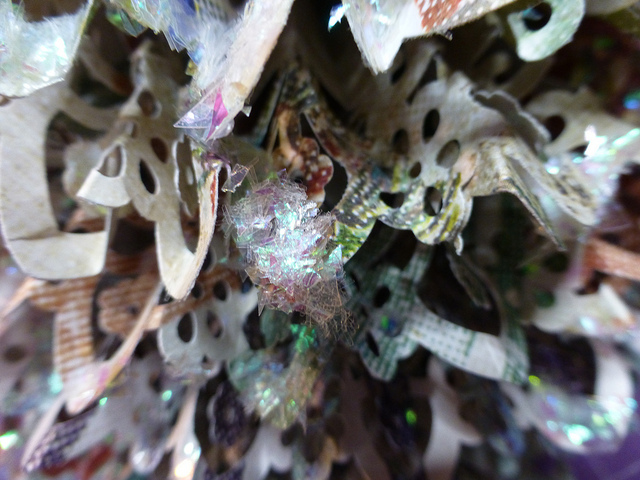 I don't know whether you can see the black chipboard between the two layers... But it's there. Mo, what I did with the glue and don't tell anybody, especially Dyan Reaveley, I used Dyan's pipettes and sucked the glue up into the pipette and squished glue onto the edges of the "limbs." Then basically I used the pipette to drizzle the glue over the tree. Next, I added the Shaved Ice and then went back over and sprinkled Tinsel Glitter over it in the wet areas. That's it! Hope that helps y'all! Thanks for coming back by! You are amazing and so kind to share!! Keep it coming!! You take things and just make them better and better. I never thought of even altering this tree. I am typing from my new tablet tonite. My treat to myself today. Jumping for joy here! How cool - you wrote detailed instructions and so quickly. I got good start on my tree today and now I'll be able to finish it with a bang tomorrow. I love knowing just how to do it. I won't even send a whisper in Dyan's direction. After all, I let my daughter use one of her pipettes as a dropper in a photo shoot. Handy little devils. Just wanted to thank you and let you know that your time and effort is being put to immediate use. Jim, thank you for the detailed instructions! You are so good to us. I hope to find some time to make one. More brilliant ideas! Thanks, Jim! Thanks, Jim. I will have to make one of these...or more. This is a beautiful tree, Jim!! I really like how the punched edges really dress up the tree. Thanks for sharing the photos and the dimensions. Thanks so much for sharing this. I just don't have the space for a full sized tree and have been missing the festive look it brings at the holidays. I will be making this next weekend for sure or perhaps a little each evening - I can't wait to get started. Thanks again. My goodness, that tree is beautiful. So much work! Now I remember why I like to work in miniature. But what a glory your tree is. Really cool tree might have to give it try if I can, lol. Can I pay you to let me come & play in the your craft room? Please?!?! So much fun stuff!! This tree is absolutely GORGEOUS!!! Your tree is just lovely. Thank you so much for sharing the measurements! I so love this tree!!! Thoroughly enjoyed visiting with you and your family ( via youtube)as y'all crafted together! Thanks for the tut for the cute tree! Your tree is gorgeous Jim!